The SC200 is a device that can put some (but not all) launch monitor stats in the hands of the average golfer and really help your game. Great accuracy for the price. Keeps up with much more expensive options. Portability makes it great for taking to the range and even out on the course. Lacks the metrics of more expensive launch monitors such as ball spin and launch angle. This is an amazing tool for improving your game and dialing in your distances. Smaller size means you could bring this to every practice session. I am excited to talk about the SC200 Swing Caddie. This has the potential to be a game changer for golfers of all levels. 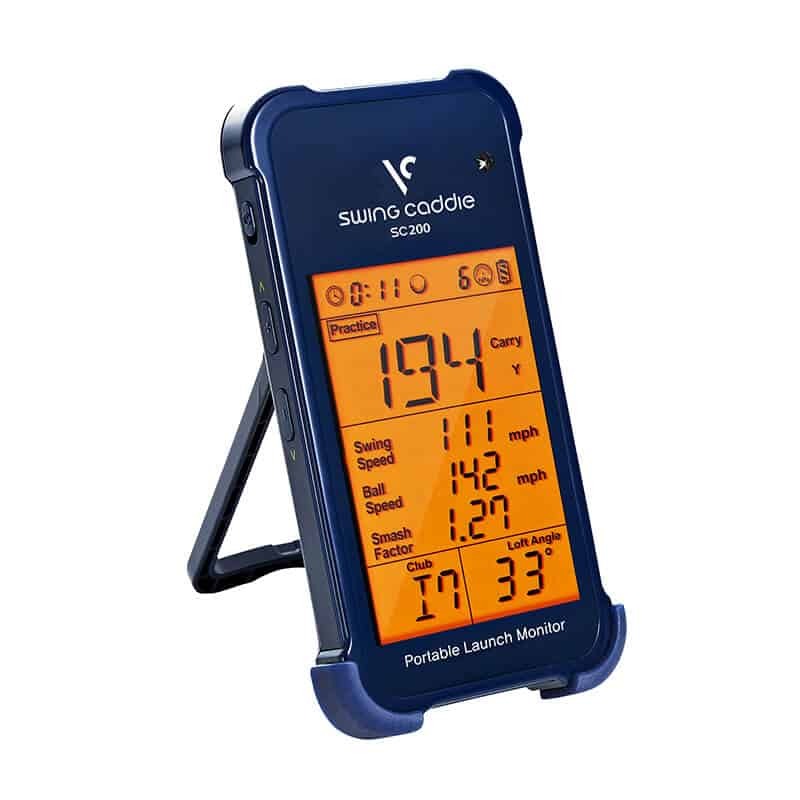 The Swing Caddie SC200 is a consumer priced launch monitor that uses a doppler radar sensor. It is also portable enough for you to take to the range or even the course. It can be used to compare and monitor club performance from each type of golf club in your bag. This golf launch monitor has earned positive reviews from customers because of its unique design and its remarkable analyzing capabilities. You would be hard pressed to get more accurate and usable shot data from a less expensive more portable alternative. The Swing Caddie SC200 is capable of monitoring several different advanced parameters including swing speed, ball speed, and carry distance. It is also capable of monitoring specific and in-depth statistics for each type of club in your golf bag. This is probably the most helpful aspect of the device. It will record all your distances for a single club and then provide you with an average. Two important numbers to know for each club are your average distance and your best distance for each club (the distance the ball goes when you hit it perfectly. That will help you get closer to the target on average but will also let you feel comfortable laying up or preventing the shot from flying past the green. There is an optional audio output capability that can be toggled on the device at any time. This function will verbally read your distances to you, allowing you to focus on your shots and reset for the next one quickly without having to look back at the device. Voice Caddie guarantees that it can accurately measure all statistics within this range within a very narrow and accurate margin. There are a number of different ways that this device can help your golf game, but the most important way that it can improve your game is by providing advanced feedback about every swing that you take so that you can find consistency and accuracy with each club in your bag. What Does The SC200 Measure? 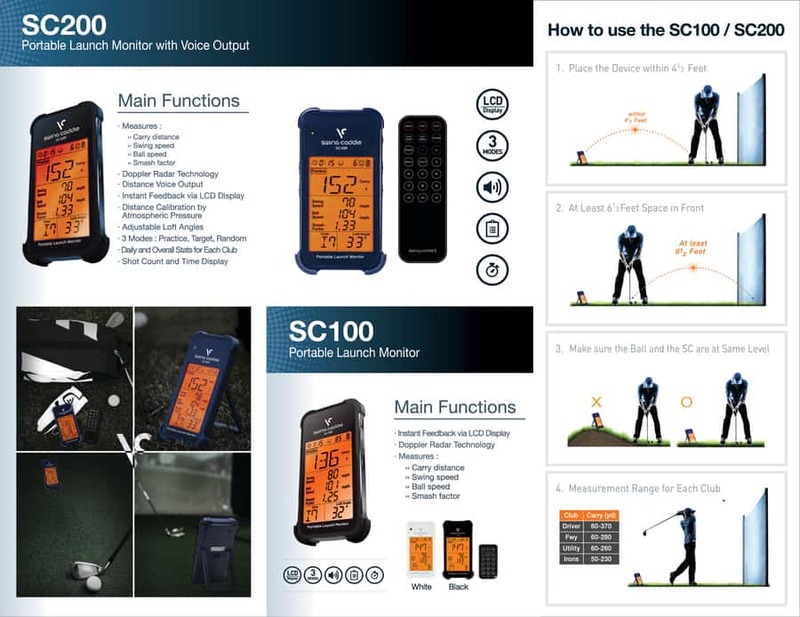 The Swing Caddie SC200 measures and analyzes six important performance-related attributes. This device tracks the overall carry distance of the golf ball, swing speed and ball speed, as well as the loft angle of the club that you are hitting. At the completion of every swing, you’ll be able to work towards finding more consistency by using the information provided by the SC200. This device is great for beginners as it provides a lot of different monitoring parameters that can be analyzed to improve your golf game. There are different modes that can be used at any time to gather different types of information relating to the club that you are swinging. Each mode gives you a different way to practice your game. The practice mode displays shot distance, swing speed, ball speed, and smash factor. It also includes time played and total shot count, which I found to be less useful unless you wanted to stick to s specific shot count for each practice session. Target mode lets you set a target distance to test your consistency. It gives you 10 shots at that target distance and then registers a score (out of a possible 10) based on how close you were to the target for each shot. This can be useful for dialing in a specific club. This was by far my favorite mode on the device. It is essentially the same as the target mode in that the device has a specific distance and then gives you a score out of 10 based on how close you came to the target, but it changes the distance after every shot. This is a tremendous way to work on your game. The Swing Caddie SC200 advertises that it is capable of measuring within 3% margin of error on just about all of its parameters that it measures. It even contains a barometric pressure sensor within the device to automatically calibrate it for elevation and air pressure variations. This is an impressive claim that seems to be backed up by the devices performance on the golf course. In looking at the online reviews, very few customers have complained of inaccurate information which is one of the reasons that this device has received such positive reviews among golfers that use it. It is hard to doubt the accuracy of the SC200 currently based on its current capabilities. From the looks of it, this is a major improvement from the first version of this device and surely there will be more improvements in the following products that come out in the future from this brand. How You Can Use The SC200 To Improve Your Game? The biggest thing that this device can help with is distance consistency. The Swing Caddie SC200 provides all of the necessary information to dial in your club distances quite well. It may not directly teach you how to swing, but getting instant feedback (even if it is just distance) can be a huge shortcut to improvement. For example, being able to see that swinging a little more aggressively may actually hurt your distance may be a great constant reminder to make that adjustment. Over time, you’ll ingrain that into your swing and the improvement will come. Whether you are a beginner or expert, knowing your distances, tracking your distances, and being comfortable hitting to those distances is vitally important to scoring well. I found this to be a great tool for doing just that. The primary difference between the SC200 and the SC100 is the ability to enter the exact loft of the club that you are using. The SC100 let you choose the club which was assigned a default loft. That certainly was unable to reflect the fact that many golfers had non-standard lofts on their clubs. In fact, even off the shelf clubs could vary significantly in loft from one brand or model to the next. Because of this prior shortcoming, the SC100 often provided inaccurate information outside of a range that is acceptable for golfers. This was a major change for the SC200 which now provide the margin of error based range of parameters that are guaranteed to provide nearly 100% accurate information within margin of error. Overall, the Swing Caddie SC200 is one of the best game improvement devices you can buy for the price. While it doesn’t give you all the stats that more expensive launch monitors do, it’s portability and ease of setup make it a device that you can take to every range session to regularly monitor your distances. I highly recommend this device for any golfer that wants accurate yardages and quick feedback when practicing. You can usually find it well below the MSRP…CLICK HERE to check out the current prices on Amazon.